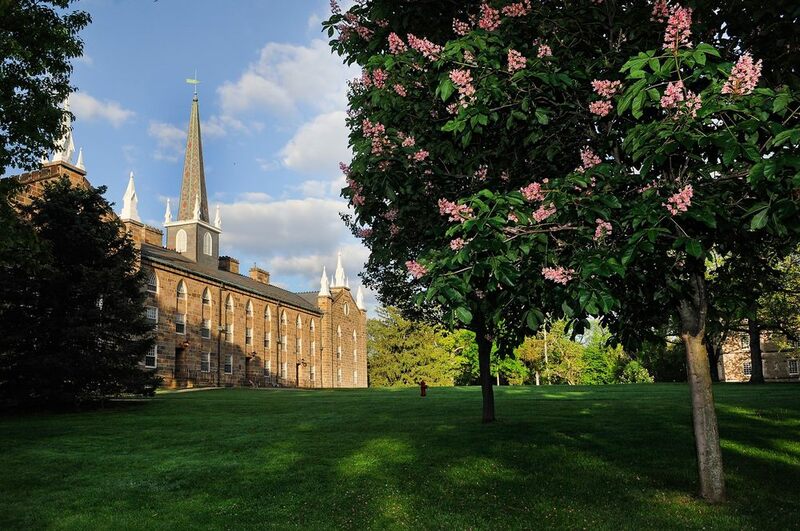 Kenyon’s beautiful campus is located in Gambier, Ohio, approximately 45 minutes from Columbus, the state’s capital. The rural setting, surrounded by cornfields, is home to approximately 1,600 students. Kenyon is a private, liberal arts college founded in 1824. The campus spills into the small, quaint downtown and the historic town of Mount Vernon is a 10-minute car ride; also a good base for a visit. Stay: The Kenyon Inn is right on campus, owned and operated by the school. Just down the block, check into the Gambier House, a charming bed and breakfast. In Mount Vernon you’ll find a Comfort Inn, Holiday Inn Express and the cozy Mount Vernon Inn. Transportation: Port Columbus International Airport is the closest major airport, about a 60-minute drive from Gambier. There is no public transportation (other than taxis) between the airport and Mount Vernon or Gambier. The GoBus travels between Wooster and Columbus with stops in Gambier, Mount Vernon, downtown Columbus and the John Glenn International Airport. Coffee and Breakfast: You might overhear students telling each other to meet at the "wiggle and the ground", the official slang for Wiggin Street Coffee; it’s the place at Kenyon where everyone meets up with friends or professors for a cup of coffee and a light bite. Lunch: Sandwiches and salads are the draw at the Village Inn. Many students’ head to nearby Mount Vernon for meals, with more restaurant options ranging the gamut from ethnic and eclectic to all the usual variations of pizza and burgers available near all college campuses. Students head to Southside Diner or North Main Café for a quick bite. Casual: In Mount Vernon, Fiesta Mexicana is well liked by students for a fun Mexican night out. Other popular choices include Ichiban Sushi, Bombay Garden and Greek Eats, combining both Indian and Greek, and Hunan Garden. A Step Up: When parents are in town reservations are hard to come by at The Kenyon Inn, the best option in Gambier. In Mount Vernon top choices are The Alcove Restaurant and Lounge and WineStein. Local Attractions: Gambier is a small town, but there are a few worthwhile things to do after your tour. Rent a bike at the bookstore and go for a ride on the Kokosing Gap Trail, a 14- mile recreational trail built on an old Pennsylvania Railroad line. Or visit the impressive Brown Family Environmental Center, a 382-acre nature preserve right on campus. Trails are open during the day for walking and hiking, don’t miss the wildlife garden. Kenyon is only an hour’s drive from Columbus, the capital of Ohio and the 15th largest city in the U.S. For more on things to do and places to eat in Columbus visit our Ohio State University itinerary here. Just toured the Kenyon College Campus? Are you a Kenyon College student, parent or Alumni? Fill out this 2 minute survey to supplement our Daytripper University Guide for Kenyon College!